It is sad but true and he is more than ready to move on to first grade but I don't know that I am ready to admit it. We have been so blessed this year with a phenomenal teacher. I wish we could just stay another year or two! Friday they had a luau for their end of the year party. It was really cute! They sang some songs, recited some poems, and did some readers theatres too. 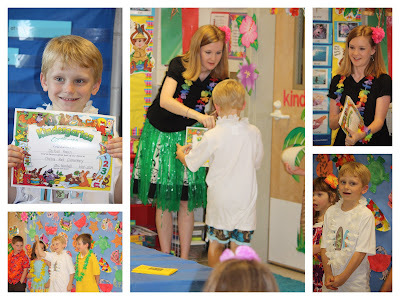 They also got Kindergarten Certificates and ate yummy party food! Congratulations Buddy! We are so proud of you! aw..it is sad to grow up.. I can't believe he will be in first grade and brylee in kindergarten. wow..where does the time go? it seems like yesterday they were babies..